Chief Automotive Technologies offers the most extensive line of collision repair equipment, including frame machine, measuring tools, anchoring systems, welding, aluminum repair, aluminum welder, vehicle specification products and we offer Chief University a collision repair school providing the most up-to-date training in the industry. Chief continues to aggressively develop and launch innovative products that enable shops of all shapes and sizes to become more productive and successful. We offer everything you need for any collision repair. Chief offers collision repair shops a total repair solution. We supply equipment to diagnose and identify collision damage, repair the damage through pulling the frame, replacing parts or welding, and document that the vehicle was returned to the original manufacturer’s specifications. The level of sophistication Chief welders offer goes beyond just melting two metals together. Data reporting on weld strength, automatic tool recognition and similar technologies provides repair technicians with more time to repair and less worry about ever-changing demands on the collision industry. You’ll be happier that vehicles are being repaired faster with better results and in turn, making your shop more profitable. Las Vegas (Oct 30, 2018)SEMA Booth #10122 – Chief distributors are now able to offer Celette’s full line of OEM-approved collision repair and measuring systems across most of North America, South America and China, the two leading collision repair equipment manufacturers announced today at the SEMA Show 2018. Today’s announcement expands on a heavy-duty product distribution agreement the companies reached in April. Madison, Ind. (June 4, 2018) – With its 32nd year of sponsorship of the Collision Repair Technology (CRT) Championship at the SkillsUSA® National Leadership and Skills Conference, Chief is helping create an opportunity for future collision repair professionals to compete for a national title and sharpen their skills for a career in an industry where they are sorely needed. The foundation of a solid collision repair remains the trusty frame rack, backed by a reliable measuring system. Chief's Structural Holding Package includes vice clamps that can be used to secure vehicle frames to the rack at multiple locations. The additional holding points provided by the Structural Holding Package help distribute pressure when pulling out frame damage, which reduces the risk of inflicting additional damage to the vehicle. Chief Accessory Packages feature the most innovative tools for repairing today’s vehicles.These pulling accessories are available in eleven configurations, offering maximum versatility to keep pace with the evolution of automotive design. You can make precise pulls on hundreds of unitized and conventional frame models while minimizing the possibility of distortion. Another innovation from Chief – the Universal Anchoring System, now featuring Chief’s Uni- Clamp design, which requires just one bolt size instead of three as on previous systems. Technicians need only one socket, and each stand has four bolts instead of six so there are fewer bolts to tighten. The Uni-Clamp can be retrofitted onto existing universal anchoring stands to increase anchoring speed and productivity. Modern metals are taking over in many vehicles. And in order to stay relevant and maintain your revenue, your shop needs to understand these new metals and how to deal with the challenges that come with them. 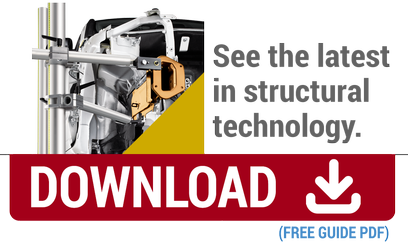 This eBook covers the two most prominent modern metals—aluminum and high-strength steels—as well as their challenges and the equipment you need to keep your shop repairing any model that might drive through your doors. Chief Automotive Technologies is one of the world’s largest manufacturers of high-quality collision repair products and services, including frame-pulling equipment, vehicle-anchoring systems, measuring systems, and vehicle frame specifications. Chief is also aleading provider of comprehensive training on structural analysis, measuring, collision theory and design based repair. Chief’s collision repair equipment is more powerful, versatile and capable than ever before, and has been specifically designed to service modern cars and trucks. Vehicles designed and manufactured today are technologically light-years ahead of vehicles that rolled off the assembly line just a few short years ago, and this fundamental shift in how vehicles are conceived and built is why you need a company like Chief behind you. Chief Automotive has several Design Based Repair Systems® on the market today, with more to follow. These systems have been specifically designed to allow shops to use the “Best Way Technology™” available to make the appropriate repairs. Additionally, Chief offers diagnostic products to assist in validating the status of vehicle systems once repairs are made, and is even working to address the issue of quickly locating OEM vehicle data. Get comfortable with the phrase "Design Based Repair" because it’s shaping up to be the future of the collision repair industry for many years to come. Cheif will be here to help you navigate that future.